Coqui the Chef: Recipe: French pancakes "Crepes"
French pancakes are know as 'crepes', and they appear in regional variations throughout the country. They can be stuffed, rolled, gratineed with cheese, spread with jam and glaceed with powdered sugar, doused with brandy or rum, fried, sauteed, or flamed. 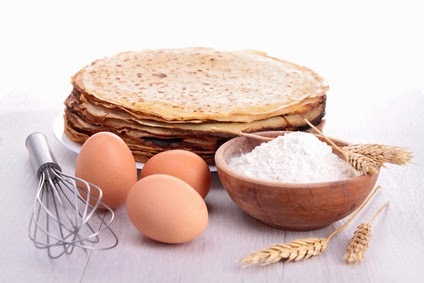 Crepes are thin pancakes made from a batter containing eggs, very thin. TIP: When you are making any kind of pastry you have to sift the flour before use and be precise in all the measurements because it will give better texture to your product or plate. Rinse the green peppers and cut them in half lengthwise. Remove the core, large veins, and seeds. Slice in thin strips. Gently heat the olive oil in a heavy - bottomed pot and add the onions. Sweat them slowly without coloring (low heat). Lightly crush the garlic clove to peel it and add it to the onions. After about 8 minutes or so add the peppers. Season lightly and let the mixture stew for about 10 more minutes. Monder* the tomato. Slice them into small medium cubes and add them to the onions mixture. continue to stew the basquaise mixture until all the excess liquid has evaporated or until the mixture is really tender, remember to remove the garlic clove. Taste and adjust the seasoning. In a separate bowl whisk the eggs and half of the milk together. Now add the whisk eggs mixture into the bowl with the whole wheat flour and whisk constantly in the middle of the well until the mixture is smooth. When the mixture is smooth, add the remaining milk. Strain the batter and let it rest for half hour minimum. Add the beurre noisette (cooled) to the batter. Clean and heat a small medium pan and add oil or clarified butter, pour off the excess.